Warehouse lighting retrofits usually involve LED or fluorescent high bay or low bay lighting fixtures. When retrofitting warehouse lighting fixtures with LEDs or fluorescents, lighting contractors should start by evaluating the existing lighting system to determine how the newer lighting fixtures can be best integrated into an older high pressure sodium or metal halide warehouse lighting plan. Selecting the right lighting contractors, designers and suppliers can be half the battle, since they’re aware of how the latest warehouse high bay lighting fixtures can positioned to achieve the right lighting design and energy efficiency goals. The best lighting contractors can perform warehouse lighting retrofits that take full advantage of advances in energy management based on the latest standards and regulations. For example, though LED high bay lighting has made rapid advances, it is not automatically the best solution for every warehouse – so managers shouldn’t be quick to do full LED warehouse lighting retrofits before fully understanding all the costs and options. Is the existing warehouse light level adequate? Is it too bright or too dim? Can task performance be improved either by adjusting illumination or reducing glare? Can employee productivity/safety be improved? Can energy consumption or maintenance costs be reduced? 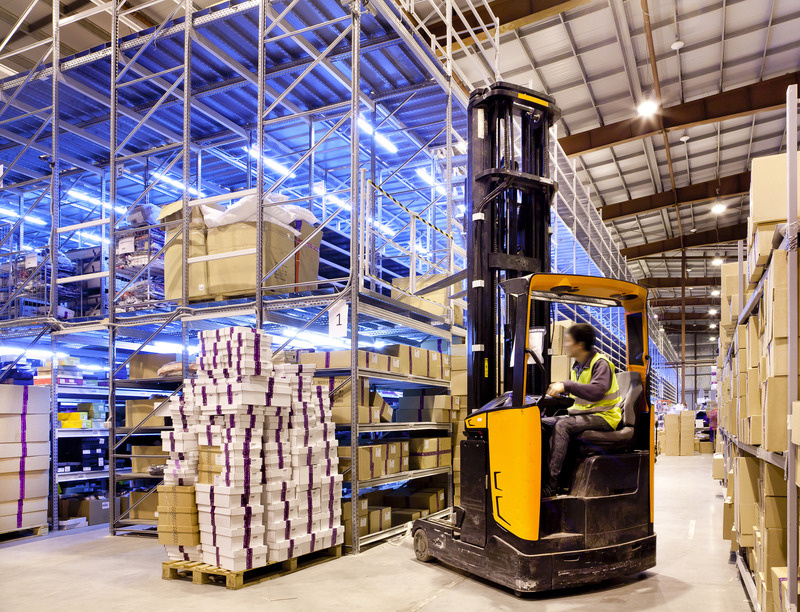 Can warehouse lighting retrofits make maintenance easier? Are changes to the work processes or equipment anticipated soon? Dibble says once goals have been set, managers next need to understand the potential total cost of ownership (TCO) of the proposed warehouse lighting retrofit: the initial expenditure against long-term savings in operating costs. LED high bay lighting, for example, have a higher upfront cost than fluorescent high bay lighting fixtures. In this instance, the greatest TCO can be seen when accounting for the combined savings of lower energy consumption, minimal need for maintenance, reduced operational interruptions, lower cooling costs, and related additional benefits. One recent example is a project undertaken by Venture Lighting Europe which supplied a custom lighting retrofit gear tray to help a Costco store in Birmingham England reduce its energy consumption. The lighting retrofit also helped the store improve the lighting of its underground car park. The company worked with lighting maintenance contractors to develop a 50W LED retrofit gear tray to replace 300 150W Metal Halide lamps using the existing fittings. The LED lights consume about 70 percent less electricity than the lamps that they replace. The 300 LED lamps were installed in the store’s underground car park to promote a safe and customer-friendly environment. Due to the nature of the car park, expensive fixture replacements would have required extra drilling into the concrete structure, creating construction challenges. Venture’s retrofit solution eliminated these issues while minimizing the costs and installation time. Venture created the 50W LED retrofit gear tray to meet the light and performance that the car park demanded. The company designed the retrofit gear tray to fit the existing luminaire body. The gear tray is comprised of three of Venture’s linear LED modules and a 50W fixed output driver. According to Venture, the new gear tray reliably delivers excellent light with an efficacy of up to 148 lumens per circuit watt. The projected lifetime of the new lamps is above 60,000 hours. Another recent successful warehouse lighting retrofit is Vac-Con, a Florida-based manufacturer. Through previous expansions and building acquisitions, the company had become burdened with maintaining a varied and complex lighting system that required significant investments in technical knowledge, warehouse space for spare parts and waste, as well as capital spending. Over the last ten years, Vac-Con implemented higher efficiency fluorescent lighting to replace the mixture of sodium vapor and metal halide on all interior fixtures. The company found further improvement using inductive fluorescent fixtures to replace their aging metal halide exterior fixtures across the 17-acre campus. The lighting upgrades also boosted productivity and reduced flaws in finished products due to inadequate light levels, avoiding time and resources spent on paint, assembly, and fabrication re-work. “Vac-Con experienced greater than 48 percent energy demand reduction through both evolutions, said Vac-Con’s Bill Barnes. A third example is Personal Security Products, a Little Rock, Arkansas firm. Personal Security Products (PSP) has undergone a lighting retrofit in two of its warehouses, a combined 11,800 square feet of space, saving $3,410 per year in annual energy and maintenance costs and increasing light levels by nearly 300 percent. Before the retrofit, PSP’s warehouses were lit by 28 metal halide fixtures, each using about 456 watts of electricity, and by six T12 fluorescent high bay fixtures. They replaced all the existing lighting fixtures with six-lamp T5 high bay fluorescent fixtures. The new fixtures use only 351 watts of electricity. Only 20 new fixtures were needed to increase the lighting levels in each warehouse. The original lighting system delivered an average of 7.6 foot candles of light, well below the Illuminating Engineering Society (IES) light-level recommendations for warehouse operations. The retrofit increased the average light levels to 21.7 foot candles. The lowest light level anywhere in either warehouse is 18.6 foot candles. The new lighting alone consumes 49 percent less energy than the original lighting. PSP also added automatic lighting controls, further reducing the energy consumed by the number of hours the lighting is on. The annual burn hours of the new system resulted in a decrease of 30 percent from the annual burn hours of the original lighting. Another area of savings for PSP is on lighting maintenance. The new lighting boasts average lifespans of 15,000 hours longer than the original lighting. PSP expects to save more than $1,300 in annual lighting maintenance costs. The entire retrofit cost $10,259 initially. However, through Entergy Arkansas, PSP received a $0.21 rebate for every kWh reduced. Since the retrofit reduced energy consumption by more than 27,000 kWh, the project received more than $6,800 in rebates. The net cost of the project for PSP was $3,456. With the rebates and savings on energy and maintenance bills, the project paid for itself in one year. The warehouse lighting retrofit is due to deliver more than $3,400 every year in positive cash flow. Copyright © 2016-19 Wholesale Contractor Supply. All Rights Reserved.